Given how long it’s been taking me to produce original content lately, I should probably be naming this post “Chinese Democracy.” Instead, as Mr. Prangeway joked to me earlier, this post is about the “Mall of the Least Resistance;” a center with a relatively small photo set that I can put together before I collapse into a pile atop my keyboard. I swear I won’t be so busy soon; I miss you guys. 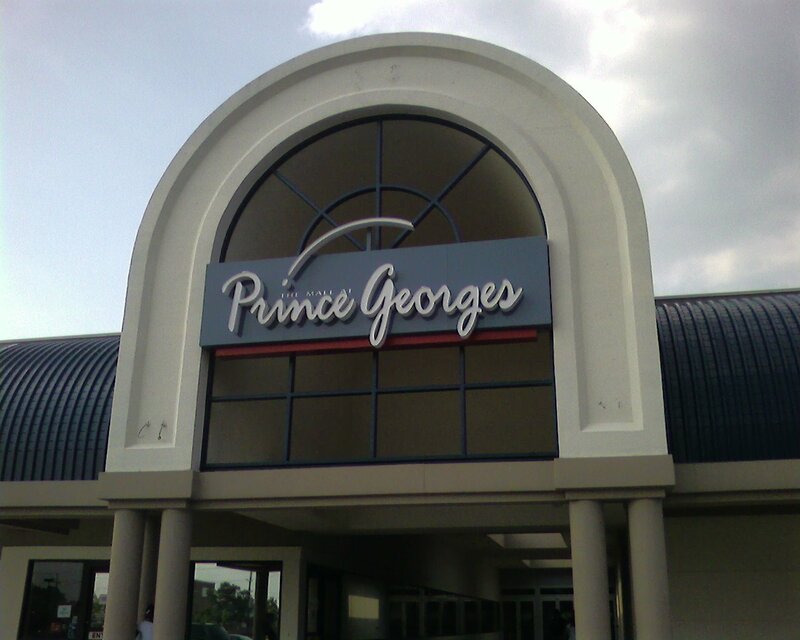 Prince Georges Plaza–retitled in 2004 as The Mall at Prince Georges–is a successful, mid-tier mall located in the inner-ring Maryland suburbs of Washington, DC, not far from College Park. Originally constructed as an outdoor plaza in the 1950s, the mall was enclosed at some later date. Sadly, my “research” on this mall is turning up quite little, so I may have to defer to the peanut gallery to fill in some details. 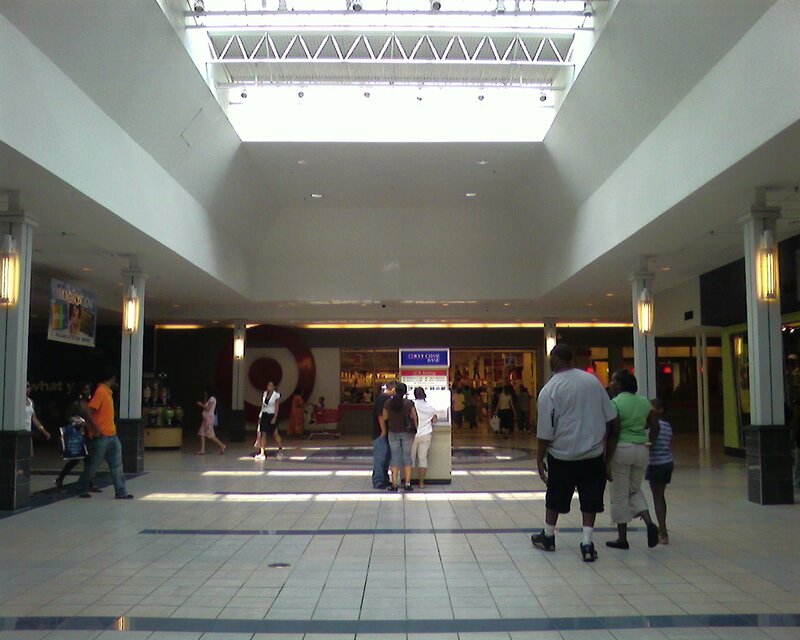 Unlike a few malls we’ve posted about previously in Prince Georges County, such as the groovy Iverson Mall or the rubble pile over at Landover Mall, this one is located in the suburbs closest to DC’s Northeast quarter, and is not terribly far from College Park (and the Beltway Plaza, another distinctive old mall featured here before). Despite the mall’s visible age, it appears as though it received a substantial renovation relatively recently, making things bright and shiny (and perhaps a bit boring). A 2002 article about the planned Target store at the center notes they’d replace the space vacated by G.C. Murphy, implying that the space was likely vacant a long, long time before Target arrived. The store finally opened in October 2004, according to this article about the mall’s $6 million renovation, which they peg as happening in 2004. The center mostly employs the classic single-dumbell design, although there are a few things that mix it up. The strange loop in the front of the mall (complete with a truly strange back hallway that hides the bathrooms) and various tucked-away big box anchors are somewhat unusual, as is the way that two of the three anchors are situated at the back of the mall yet in-line with the main concourse–a sure sign that the center began its life as an outdoor plaza. My photos are somewhat unremarkable, partially due to the busy mall’s narrow main concourse. I did, however, manage to get a just-in-time shot of the Hecht’s store before the great switcheroo of 2006. Gimme some history, boys and girls, so that I can go to bed. It opened in 1959, with Grand Union & GC Murphy as anchors. Woodward & Lothrop (current JC Penney) and Hecht’s were added around 1964. I visited the mall in the early 70s and seem to recall the department stores being set back from the original plaza, which faced University Blvd. There were several places where this still unenclosed plaza basically had stores in lanes perpendicular to the main plaza which led back to the anchors. It was not a huge shopping center but had stores like Brentano’s, People’s Drug, and the usual run of chain clothing stores. At that time, Grand Union was still there (the store must have been considered huge when it opened—–probably 30K sf), but I believe it was later demolished for a big box, probably when GU left the market, which I think was early 80s. The enclosure probably dates from that time. The mall has been considered endangered for quite some time, with many vacancies. I haven’t seen it since the renovation, but I’d wonder if, like Wheaton, it draws more people than real spending. The Target is likely to be a big draw (like Wheaton) but I wonder how much it will help the mall. A couple things may help PG Plaza: the Metro is running yellow line, as well as green line trains, whih will make metro access more popular, and there is beginning to be gentrification in nearby Hyattsville. Still, the economics are a mix–the nearby sections of DC probably have better housing stock and a more promising future than some of the ‘burbs closer to the mall. That part of DC has relatively little retail and a growing amount of gentrification which may benfit PG in teh future. On my >Flickr! photosetI have a bunch of pictures of this mall from 2005, after the Target and before Macy’s. They’re not exceptionally good, but they are pretty comprehensive. 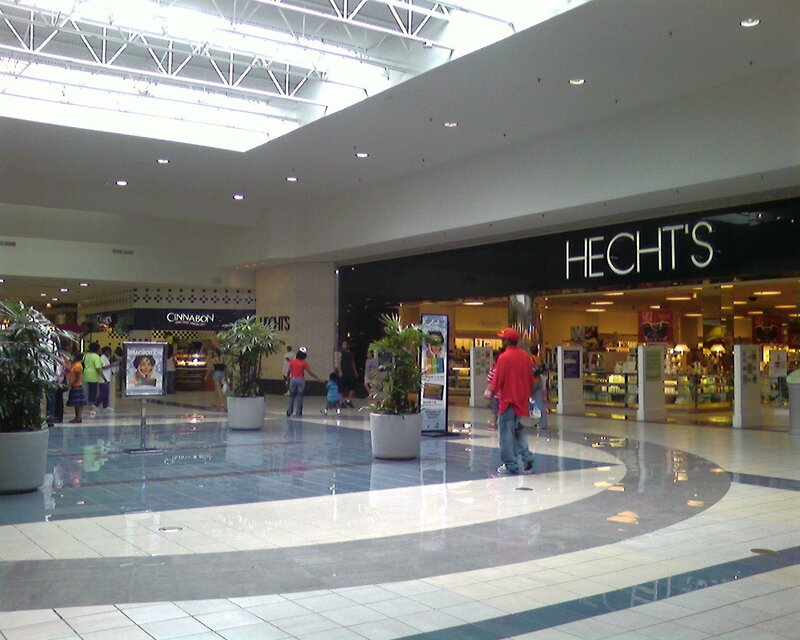 From the thinner (better looking) interior logo on Hecht’s, it’s a good bet that the mall was enclosed in the ’80s. JCPenney was a Woodward & Lothrop up until 1995, though it looks remarkably like a JCPenney should have been there from the start. The Hecht’s was/is a treasure. When I was there it had only been lightly remodeled from its original form, and some of the vintage ’50s details were incredible, like round fluorescent lights and an escalator well that was simply cool. There’s an Office Depot in the mall which used to be a Grand Union. I don’t know if that opens to the mall itself or not. http://www.preit.com/download/leasing/detail/leaseplan/26.pdf This lease plan shows that Ross Dress For Less and Marshalls just opened, and it seems that those stores are underneath Target. Good post. By the way, it can’t be “Chinese Democracy, since that would mean that you fired all of your cohorts, have said you’d post to the world 5 times, and still have nothing, and would go and get in a brawl with some yahoo from Upstate NY. By the way, don’t you still have the Pyramid Mall from your trek across the Southern Tier a few months back that would be pretty easy to put together? Found a 2004 Washington Post article which said this mall opened in 1959 as an outdoor shopping center, was enclosed and remodeled in 1977 and remodeled one other time, in 1990. Also, the article described the GC Murphy space as being vacant since 1999. When did Murphys go under? because there must have been other occupants of their store later on. Murphy’s went under in 2001 according to Wikipedia, so it’s possible that the store could have been vacant for only a year or two. 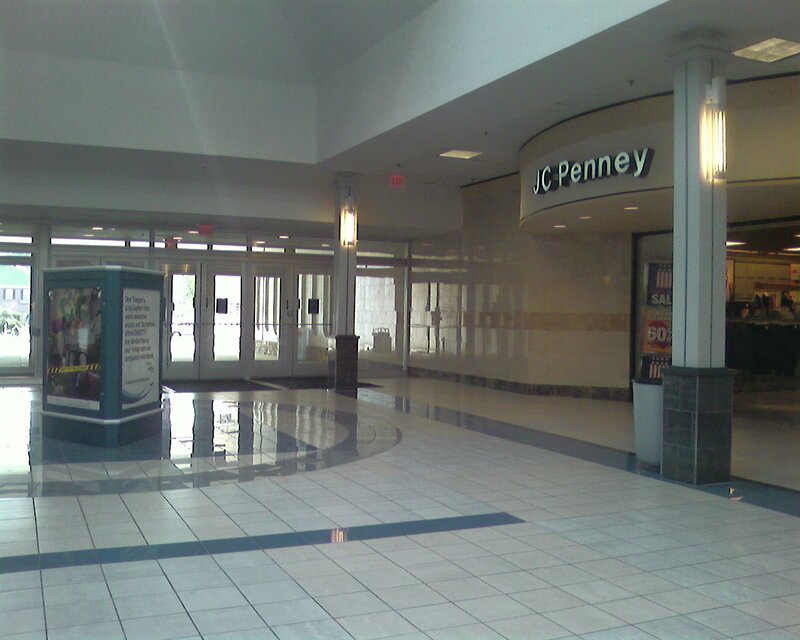 Used to go to this mall all the time when I lived in PG County. Haven’t been there since I moved up 95 to the Baltimore area about 7-8 years ago. Essentially, this mall is DC’s equivalent of Security Square in Baltimore. While it’s advantageously located off the Metro Green Line and around the corner from the University of Maryland, it draws from a rather “urban” audience, and that used to scare a lot of people away. The look on people’s faces when I said I shopped there pretty much said it all. I thought that unfortunate, because there’s nothing wrong with the mall. It’s clean, it’s well-tenanted, it’s nicer than the other (mostly dead now) malls in PG County, and I never felt unsafe there…it’s just not frou-frou like most of the malls in Montgomery County. I’m wondering how the growing gentrification of DC and the Target have changed things. The latter, I imagine, should be doing a decent job of luring in people from UMD. Any insight? I’ve been a long time reader of this site–this is my first time posting. It’s a very nice mid-tier mall; should definitely be good for the citizens of PG County. I think, DayGlo, that if you’re talking about Target attracting UMD students, then I think that’s the case. With cheap prices and, let’s face it, limited resources as a student in the way of money, there would be no trouble attracting college kids there. For Prangeway or Caldor–it seems that a lot of talk in this about growth/”urban sprawl” as it pertains to PG County.. I think a piece about The Mall in Columbia (Columbia, MD) would be perfect for this site–there is talk right now about redeveloping Columbia into more of a “city center”–and one of those plans is expanding the mall another 200-300k sq. feet. Nice job on this site. Wow, what’s with the JCPenney lettering in picture 5? That sure looks like JCPenney wanted to go cheap with putting up that lettering, since the font of that sign doesn’t seem as big as most of their interior signage at most malls I’ve seen. I remember visiting the mall in the mid-90s, when the Metro was under construction and the surroundings were probably a little more desolate than they are now. The mall environment itself seemed fine, but it looked like a place in decline. If the surroundings have more life now, it may help. There’s a Target on Greenbelt Rd that’s probably more convenient to UM-CP in an area of big boxish retailers that gets a lot of students. PG Plaza’s fortunes probably aren’t tied to the University, but rather to whether Hyattsville comes back (it hasn’t slid too far), what happens with gentrification in North East DC and whether nearby communities like Adelphi and Chillum get more prosperous or less. That general area of PG County seems to have more going for it than the area South and East of DC. There doesn’t seem to be the level of violent crime and the multi-family housing seems to be in better shape (PG allowed developers to build anything in its heyday). Hyattsville isn’t doing too badly and Ranier Park has been discovered by gentrifiers. Places like Riverdale look like they are economically stable and Langley Park looks a little better off than it did 10 years ago. If the immigrant populations in places like Langley, Adelphi, & Riverdale prosper and remain in the area, it will be good for PG Plaza. If they could a Lowe’s (the nearest ones are much further out), they regularly could draw a few Northwest DCers like me. Steven, thank you so much for those pictures…I looked at every single one! I have to agree that the Hecht’s there is very cool. Maybe things have changed, but when I lived in the area, it didn’t seem like Beltway Plaza pulled in many UMD students either. Don’t know where they did their food shopping. DayGlo!…that’s interesting. I live in Howard County, so I have an outsider’s perspective on the situation here. It seems to me-based on what I’m reading–that there wasn’t/isn’t much in the way of development at PG County, so I suspect that those students went to neighboring counties to do their grocery shopping. I’m not sure if Beltway Plaza had a grocery store or discounter like Wal-Mart or Target…or had a draw for students in general. Maybe you can enlighten me on this. Beltway Plaza has Target AND Value City, so yes, it’s got discounters. It also has a movie theater, which I would think might be a draw for students. Greenbelt Plaza has a huge Giant. I’ve lived in the Adelphi area for the past 15 years and indeed a lot of good (and some bad) changes have happened. Most recently, the major renovation and discovery of the PG Plaza metro station as a place for “Smart Growth” has radically changed that once seemingly forgotten inner suburb commercial node to a new, hip “town center” (altho slowly). It’s a great tribute to Gov Glendening (who used to live in the ‘hood) and was a great promoter of Smart Growth. Keep in mind that the same developer folks who “discovered” Ballston, Courthouse, Pentagon City, and those other cookie cutter “trendy” places in No Va have now “discovered” that people (real people who have money and want to do things like buy clothes and eat that is) actually live in Prince George’s County! The developers have finally discovered that the calm, placid life we live here in Adelphi / Hyattsville (20 minutes from downtown) can now be exploited for their gain. And so goes the nice peaceful life we all once led, but you know now we have Starbucks too! However, a lot of great things are happening at PG Plaza (Mall at Prince Georges) that everyone should be aware of. It’s basically rented out with first class retailers and a decent food court (including a Camerons Seafood). An Olive Garden opened two months ago. A huge new retail / parking complex is being built across the street from the Mall and basically on top of the Metro station at E-W Hwy and Belcrest, where they’ll house the big boxes people believe are the sign of progress like Office Depot. This is next to the upscale Giant that opened last year (where a lot of UMD students who live in the area grocery shop). The new student apartments opened this year too and by next summer there will be a movie theatre complex with a gourmet Safeway and other retail stores on the east side of Belcrest. In downtown Hyattsville, they’re developing the arts district with new $600,000 townhouses, which I think are sold out. Anyway, just a few thoughts. Hope all can visit the area sometime soon because it really is changing and PG Plaza (as it will probably always be known) is at its heart. I think it’s always been our Town Center and the old photos from 1959 and posted by Gary at http://s11.photobucket.com/albums/a175/dcgrocery/Prince%20Georges%20Plaza/ prove that. Hey all, I’m so happy to have found this site–I’m an historian doing some scholarly treatments of shopping mall history. 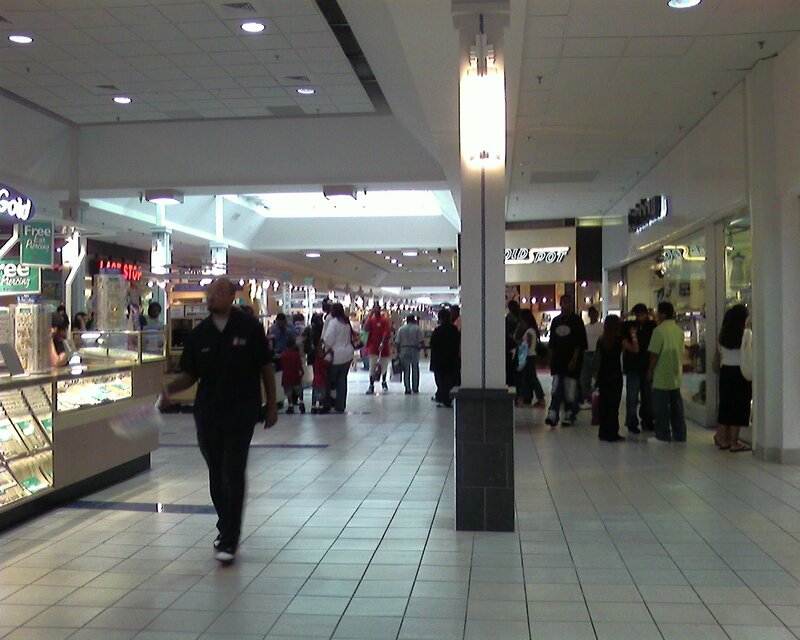 I’m working on a piece that deals with the enclosed regional malls of Prince Georges County. I would love to get any personal accounts of life in PG county malls, going back as far as possible…1960s to the present day. Oral history (or email history, if you will) is an important part of my research. I live in Hyattsville and regularly shop at PG Plaza. I did attend University of Maryland but since it’s kind of far away, most students shop at Beltway Plaza. I do have to say that while in college, I didnt like PG Plaza because I didnt think that the amll itself had that much to offer but that has changed in the past from years. The mall is cleaner and a lot of renovation have been done. Stores are not cramped and we have a lot of them. I love the Old Navy and Macys there. The food court serves a great variety of food and if you go there, Picadilly is the best place to eat. Overall, I am very happy about the changes that have taken place at PG Plaza. Very interesting thread of posts. I have visited PG Plaza since some point in college when I attended Catholic University in Northeast starting back in 2000. The smart growth development is really amazing right now. PG Plaza has seen a lot of growth since I have been around it, and it will only continue in my opinion. University Towers has brought students from many area Universities, but mainly Maryland and Howard, right next door to the mall. The increased presence of college students can be seen by just driving by the mall, and that has to be good for the area.There are several other condominium projects going up right around the area. Many of the retailers are focused on the urban community. This makes sense since PG Plaza is the only major shopping center on the green line, which makes it easy for city residents from NW and SE to shop. I see this as why it might not have traditionally drawn a big crowd from the University of Maryland. However, there are a lot of recent additions which make the Mall more attractive to a diverse customer base rather than just the urban community. Mall at Prince George’s tennants Old Navy, Target, Marshalls, Ross, Outback Steakhouse, Olive Garden, and Victoria’s Secret, as well as nearby Giant and Home Depot are businesses that are popular with a wide range of backgrounds. Coming soon to the area are a Staples, Circuit City, Ballys, and a 12 screen theater. The increased development around the mall will surely promote more development in the mall itself. The mall has a ton of potential to grow because of an increasingly middle class local Latino population, continued patronage from those who use public transportation, and towns like Hyattsville, Riverdale, College Park, and University Park that are thriving compared to other PG suburbs. Beltway Plaza is usually where the UMD students go for groceries and other stuff unless they live in that new student apartment building that sprang up over there. That’s a huge building BTW. You can see it on a clear day from the lake near Beltway Plaza. With all the new stuff springing up around the Metro station and the formerly empty parking lost around the office buildings PG Plaza looks like it should be in good shape for awhile to come, assumign none of the developers chicken out. It’s a nice place and not nearly as “GIVE ME YOUR MONEY!!!!!! !” as the Westfield malls aroudn the area. Hecht’s and G.C. Murphy were original to Prince Georges Plaza when it opened in 1959. Woodward & Lothrop was built and opened there in 1966, just behind Grand Union. Woodies faced the side and back end of the Plaza; Grand Union faced the front (East-West Highway). The 1977 renovation enclosed the mall; the 1990 renovation added a food court. G.C. Murphy closed in 1999, 30 years after opening there; it remained vacant until Target was built on that site. There used to be a Bob’s Big Boy near the entrance to the Plaza; however, in later years, it was moved to the front parking lot before closing. Now, there are Olive Garden and Outback restaurants in the front lot. Metro’s Green line, a Home Depot, and a Giant were built directly across the street, facing the Plaza. Big oops! I meant to say in my previous post that G.C. Murphy closed 40 years after opening at P.G. Plaza. How far away was this from the Prince Georges Plaza METRO station? It’s right across the street from the Mall, closer than the White Flint Station is to the White Flint Mall….the PGP Metro station is on the Green Line. I went when it first opened. It had a sewing machine-fabric shop, and it wasn’t covered with an over roof at the time. I recall the dime store, and the wonderful glass painted wind chimes as I walked in. The counters were still the old fashioned “island” types. And there was an escalator. I vaguely remember a big open field, and a baseball diamond in the general area where it was built eventually. I remember some big red blinking lights from tv or radio towers down toward Queenstown Rd or Kirkwood area shopping center. It had Atomic architecture, as I recall. After the PG Plaza mom took me to a nearby Bar B Que place. Forgot the name. Those days are missed ! @Peggy Coleman, the barbecue place was Crazy Horse on Riggs. Had jukebox selectors in each booth. The red lights were on the transmission towers of WRC on Ager Road. Don’t forget about Hot Shoppes. Does anyone remember that place? Maybe it was because I was 2 years old when we would go there and I would always get a toy at G. C. Murphy’s afterwards, but that place had the best food. @Mister Uptown Himself, loved Hot Shoppes. I worked in the white buildings and walked over for chicken livers over rice and the enormous rolls at Hot Shoppes. Does anyone know much of the history of Riverdale, Plaza? I remember before in became Riverdale Plaza in the mid-1960s I could get a pony ride for 6 Royal Crown bottle caps. @Diana Ferrara, Yes, the Woolworth’s was located between The Hecht Company and Woodward & Lothrop, with a mall entrance (across from the old People’s Drug store / later CVS before it left the mall) and a full red letter storefront on the back side of the mall. My Mom worked there and at the old GC Murphy’s (newer Target location) for a short time. As a kid, I recall the Woolworth’s lunch counter in the late 1960s. According to people I know, the mall was started in the 1950s. I would imagine it was completed and opened within a year or so after the initial construction began. Does anyone recall the Big Boy in the center of the plaza. It was at the old DC Transit bus stop at the front. Back then, it was simply Big Boy, then later changed to Bob’s Big Boy. Both Hot Shoppes and Big Boy were operated by Marriott back then. Barracini’s, Lerner’s, Lane Bryant, Phillipsborne, Hanover Shoes, Bonds Clothes, Baskin Robin, Olde World Inn, Roy Roger’s, Doctor’s Pets, Cinnabon, Citizen’s Bank, Lens Crafters, Theodore Nye, Musicland, Joseph R. Harris, Thom McAnn, Raleighs, Midway Florist, JoAnns Nuthouse, HIckory Farms, Plaza Liquors, Ups and Downs, Spencer’s, Kay Bee Toys, Daniell’s Boottery, Hahn’s Shoes, Mother Care, Kids R Us, Antiques Underground, GC Murphy Co, Woolworth’s, Sterling Optical, Hot Shoppes Cafeteria, Big Boy, Plaza Travel, People’s Drugs, Suburban Trust, Equitable Trust, Hechts Woodward & Lothrop, Radio Shack, JC Penney, Macy’s, Target and Grand Union Food Market. I’m sure I forgot something, lol. @JAMES SPEORL, Yeah, you forgot Fluf n Stuf! I was caught up in the sticker-collecting craze that was part of the elementary school scene in the 80’s and you could get the funkiest stickers over at Fluf n Stuf! Somewhere I remember reading that Nakita Kruschev visited Prince George’s Plaza when he came here in 1959. I also heard that it was the first purpose-built “shopping mall” in the U.S., though it seems a bit too young for that to be the case. The Hot Shoppes restaurant there was a great place to hang out after a movie. The Hechinger hardware store used to have a ramp to the underground warehouse area, where cars would drive down to pick up the larger items (lumber, etc) after they were purchased. I remember it was closed to civilian traffic after the late 1980’s. Not far from the Hechingers was a spiral staircase with very wide concrete steps. I used to love to run up and down that when I was a kid. The parents and uncles of one of my high school friends used to own the florist shop there, Mavrikes Brothers Florist. The new shopping center/commercial area located right by the plaza is showing some signs of being a viable commercial entity, and together with the access to Metro might revitalize the area, but it’s got a lot to overcome. Oh, BTW, Buckguy, there is no such thing as a shopping center called Greenbelt Plaza. There is Beltway Plaza (probably what you were referring to) and Greenway Plaza, but the only thing actually called Greenbelt Plaza is a tiny little run down couple of apartment buildings in the old section of Greenbelt, next to the Sunoco station. And if you want to pick up co-eds doing their grocery shopping, they’re either at the Shoppers Food Warehouse on Rt. 1 by the Beltway or at My Organic market on Rhode Island Avenue. In September you can find hordes of them at the Ikea on the other side of the Beltway getting cheap furniture for their dorm rooms or off-campus housing. @Bill T. Williams, Kruschev did visit. He wanted to see the then detached Grand Union. Boxes of cereal were at an angle and when you pulled one out, the next box dropped down. The donuts came out on a conveyor belt. James you have a fantastic memory, especially about the Olde World Inn. I had completely forgotten about that place! Here’s a few more, mostly from the days when I worked there in the late 70’s ……. High’s, Orange Julius/Orange Bowl, Cardinal Ties, Pogo (either before or after Antique Underground), and later either W. Bell or Best in that lower level space, Wilson’s Leather, Irving’s Sport Shops, HECHINGER’S (2-Levels no less) (Bet nobody remembers that! ), Mama Lucia’s, Music Time (either before or after Musicland), Vermont Federal Savings Bank, Ritz Camera, Parklane Hosiery, The Citgo Gas Station which later became the Chevy Chase Bank out in the front parking lot, and the “other” Bank that had a white drive-up window located alongside Belcrest Road (can’t remember the name, but it might have been part of Vermont Federal), the Hecht Co Tire Center in the back parking lot, The Lamp & Shade Center (in the back), the Plaza Laudromat (in the back), Jhoon Rhee’s Karate School (which was originally a Community Auditorium and which was located in the “basement” between Roy Roger’s and Hot Shoppes), Brentano’s Book Store, Ormond’s, The Barber Shop (name unknown) at the top of the concrete circular staircase in the rear of the plaza next to Hecht’s, Baker’s Shoes and Mavrikes Florist (mentioned by another poster). @Rich Hartnett, Dammit, now I got that old Jhoon Rhee Karate commercial stuck in my head! Remember that one where the kids at the end say “Nobody bothers me!” Man, talk about a blast from the past! Thanks! LOL, well guess what Amanda ………..
Glad you liked it. It certainly does bring back a lot of memories doesn’t it? Now all we need are the replays of the old “Mr. Ray’s Hair Weave” commercials on TV!!! Now it will be stuck in your head forever. DOes anyone remember that in College Park RIght near Rossburge Drive ,(where I used to live when I was about 2 yrs old (I’m 50 now) there used to be a strip mall with a Peoples Drug Store, a Woolworths Store, and a Trading Post that had a statueof an Indian named Chief Welcoma? I don’t remember a strip mall at Rossborough Drive (which is where the campus police station is located), but maybe you are talking about the shopping center which is across from the old Rendezvous Inn (“The Vou”), which had a Peoples on the corner, and a Kemp Mill Record Store to the right of it. Further in the center was a (now long gone) sporting goods store called “Herman’s Atlas,” which I used to frequent a lot in my teen years. That’s the only place I remember there being a Peoples Drug Store near the campus. And by the way, THAT People’s store is still in that shopping center, albeit under its new name of “CVS,” and it has since moved over one space, so is no longer on the corner. You can probably see it on Google Maps if you look up the interesection of U.S. Route 1 and Knox Road. Visitors to this mall cannot imagine what a paradise it was in the early 1960’s. When you tell young people what it was like, they think you are making it up or talking about another planet. Prince George’s Plaza was a lovely, elegant shopping center back then. Even simple places like the G.C. Murphy were clean and pleasant. You could have a decent lunch there at their restaurant counter, or at People’s. There was a much greater variety of merchandise than today, and everything seemed special, even a pencil. The Brentano’s bookshop was large and had a section for foreign language books! There were fashion shows in the tea room at Woodward and Lothrop. It was a different world—people, even if they were not wealthy, dressed up to go to the stores. After shopping, you could go for cocktails at the legendary Royal Arms on East-West Highway and listen to sophisticated singers or, in the evenings, live jazz. The neighborhood was once a model of American middle class life; to follow its history is to see the relentless and depressing process of national decay. Well said Adair, well said! I was born in ’59, so my memories of P.G. Plaza are not very memorable until about ’67 and up, but I do remember Brentano’s, and the great lunch counters at Peoples and Murphy’s. I always heard about the famous “Tea Room” at Woodies, but never stepped foot in it. I think maybe Hecht’s had something similar in the way of a Tea Room or simple restaurant, but I’m not sure. Maybe you can chime in on that one. And if memory serves me correct (which is often debatable), the Royal Arms Restaurant (located in one of the three white “Presidential” buildings on E-W Hwy, later became “Circus Circus Restaurant,” before permanantly closing in the late 1980’s. Yes, the Tea Room at Woodies was very elegant, moreso than the Hecht Company’s cafeteria, which was casual, although very good too. As I said, people really dressed up to go to PG Plaza, but especially to Woodies. Woodies and Hecht’s were always in competition, but Woodies was considered more sophisticated. Not far from PG Plaza, down University Boulevard, you could also shop at Langsburgh’s in Langley Park. In the early 60’s, it too was a very special department store, and like Woodies, it offered fashion shows, as well as occassional Sunday concerts for children by the National Symphony. It is hard to believe what is in that same area now. Heartbreaking. Barracini’s, Lerner’s, Lane Bryant, Phillipsborne, Hanover Shoes, Bonds Clothes, Baskin-Robin, Olde World Inn, Roy Roger’s, Doctor’s Pets, Cinnabon, Citizen’s Bank, Lens Crafters, Theodore Nye, Musicland, Joseph R. Harris, Thom McAnn, Raleighs, Midway Florist, JoAnns Nuthouse, HIckory Farms, Plaza Liquors, Ups and Downs, Spencer’s, Kay Bee Toys, Daniell’s Boottery, Hahn’s Shoes, Mother Care, Kids R Us, Antiques Underground, GC Murphy Co, Woolworth’s, Sterling Optical, Hot Shoppes Cafeteria, Big Boy, Plaza Travel, People’s Drugs, Suburban Trust, Equitable Trust, Hechts Woodward & Lothrop, Radio Shack, JC Penney, Macy’s, Target and Grand Union Food Market. I’m sure I forgot something, lol.